You, as the owner of a single building or multiple buildings, will most probably have appointed one or more building managers to manage your buildings. Under those building managers a large number of individuals will be working to help facilitate the building management process. As you you might have already figured out, this process is using a huge amount of resources in terms of time and money. What if most of these costs can be saved? What if the management of buildings can be optimized to get the maximum profit? Yes, it is possible. Building integration is the answer to this. Building integration is a strategy whose goal is to synchronize information technology (IT) and buildings by aligning technology with business strategy and goals. In this process, it has become possible to connect various building systems through a common control interface. In this scenario, many core systems like heating and cooling, lighting and security can be incorporated under one umbrella. Today, enabled in part by advances in technology, a greater degree of integration is an increasingly practical way for facility executives to achieve a range of benefits. (Facilitiesnet.com, 2018) They are as follows. Improvement of the human experience in the built environment. Improvement of the productivity of occupants and operations staff. Maximizing of the space utilization and efficiency. Empowering of sustainability and stewardship goals. The rapid evolution in miniaturization, electronics and wireless communication technologies have contributed to unprecedented advances in our society. This has resulted in an increase in the number of suitable electronic devices for many areas, a reduction in their production costs and a paradigm shift from the real world into the digital world. (Reyna et al., 2018) Hence, this has resulted in an exponential increase in the number of sensors used in the integration process. Facilitiesnet.com. (2018). [online] Available at: http://www.facilitiesnet.com/whitepapers/pdfs/20150902-SiemensIntegration.pdf [Accessed 20 Sep. 2018]. I-scoop.eu. (2018). 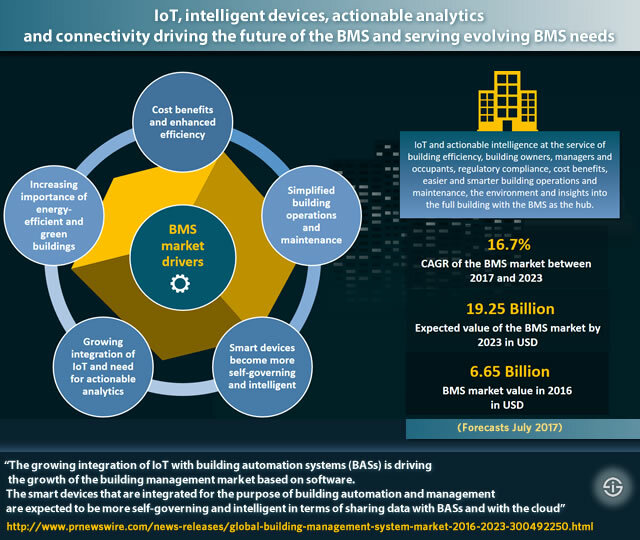 Building management and intelligent building management systems. [online] Available at: https://www.i-scoop.eu/building-management-building-management-systems-bms/ [Accessed 20 Sep. 2018]. Reyna, A., Martín, C., Chen, J., Soler, E. and Díaz, M. (2018). On blockchain and its integration with IoT. Challenges and opportunities. Future Generation Computer Systems, 88, pp.173-190. Rickart, H. (2018). Building Technologies. [online] Siemens.com. Available at: https://www.siemens.com/us/en/home/products/buildingtechnologies.html [Accessed 20 Sep. 2018]. Tracy, P. and Tracy, P. (2018). What is a smart building and how can it benefit you?. [online] RCR Wireless News. Available at: https://www.rcrwireless.com/20160725/business/smart-building-tag31-tag99 [Accessed 20 Sep. 2018].